Foodies all over Vietnam don’t know Phu Quoc Island as Vietnam’s Pearl Island. They call it the Pepper Island instead, for pepper and fish sauce are the culinary pillars, the island is resting on. You can actually find a good amount of foreign restaurants along Tran Hung Dao street. German food, Czech cuisine, Indian kitchen and so forth; the tourist strip offers anything from bars to a nice dinner in all price categories. The local kitchen is mainly based on seafood, since fishery is still a source of income for many islanders. A variety of sea fish, squid, crustacea and shellfish are on the menu, usually boiled, grilled or stir-fried. If you are a more adventurous eater, you can check out the night market in Duong Dong and try interesting alternatives like sea cucumber or grilled sea urchins. Generally, the night market is a fabulous area to satisfy your culinary curiosity. Pancakes with different types of jam are not really native to Phu Quoc, but delicious nonetheless. Spicy seaweed invokes a need for something liquid and offers a stunning contrast to sugar-roasted almonds and peanuts. Countless animals of the sea that surrounds Phu Quoc Island are displayed in large aquariums and you experience quite a zoological diversity. And the best thing about it is, they are all edible and quite appetizing to variable degrees. Since fish sauce and pepper is produced right on the island, these savory and fragrant ingredients naturally find their way into the local cuisine. 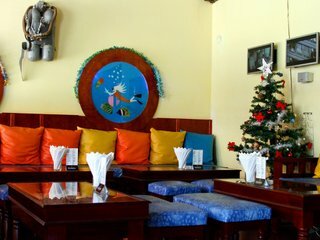 A blend of Vietnamese and Mexican cuisine at Amigos. An upmarket, classy restaurant, the Pepper Tree.Burgers, pizza or schnitzel at Pepper’s Pizza and Grill. A cozy restaurant that also offers outdoor dining at Home, Sweet Home. Fried rice with chicken right next to the post office is an exceptionally cheap, but surprisingly tasty alternative for budget travelers. German B at Tran Hung Dao street offers authentic and delicious German food at a reasonable price. Salinda Restaurant, located in the Salinda five star resort pampers your palates with Vietnamese, Indian and Italian delicacies.